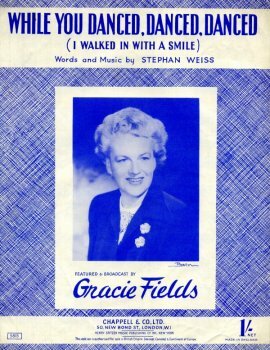 A selection of songs made famous by Gracie Fields. Chosen from 'The Open Doorway' collection. The music has been carefully scanned to retain the exact appearance of the original piece. Available for download as a PDF file. 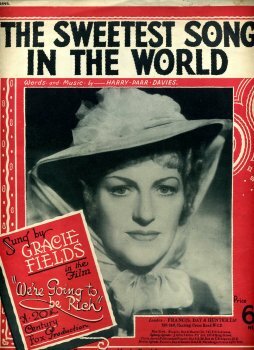 DBE (born Grace Stansfield, 9 January 1898 – 27 September 1979), was an English-born, later Italian-based actress, singer and comedienne and star of both cinema and music hall. 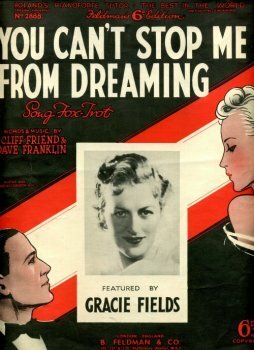 Grace Stansfield was born over a fish and chip shop owned by her grandmother, Sarah Bamford, in Molesworth Street, Rochdale, Lancashire. She made her first stage appearance as a child in 1905, joining children's repertory theatre groups such as 'Haley's Garden of Girls' and the 'Nine Dainty Dots'. 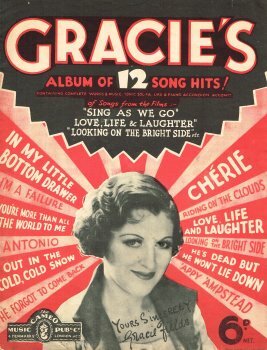 Her two sisters, Edith and Betty and brother, Tommy, all went on to appear on stage, but Gracie was the most successful. 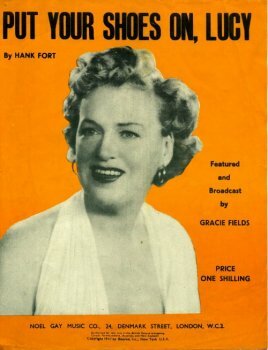 Her professional debut in variety took place at the Rochdale Hippodrome theatre in 1910 and she soon gave up her job in the local cotton mill, where she was a half-timer, spending half a week in the mill and the other half at school. Words and music by Donald O'Keefe. 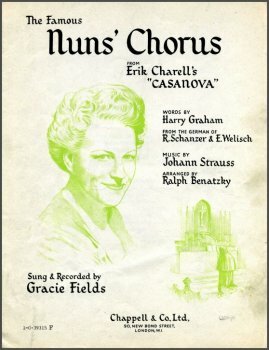 Sheet music download. Words by Al Dubin and Burton Lane. Music by Burton Lane. 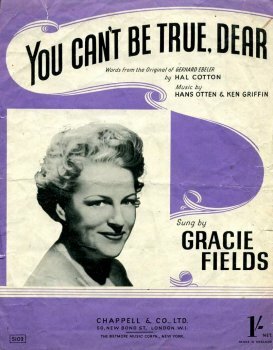 Sung by Gracie Fields. 4 pages including front cover. Alexander "Al" Dubin (June 10, 1891 - February 11, 1945) was an American lyricist. He became known through his collaborations with the composer Harry Warren. Together, Warren and Dubin wrote 60 hit songs for Warner Brothers. Words by Malia Rosa, music by Franz Winkler. Arranged for piano, vocal line with guitar/ukulele chord symbols. 4 Pages including front cover. 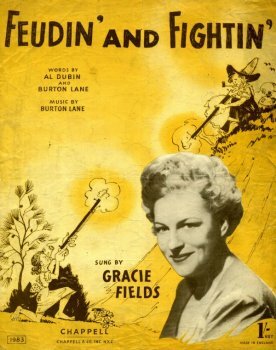 From the films 'Sing As We Go', 'Love, Life & Laughter', 'Looking On The Bright Side'. 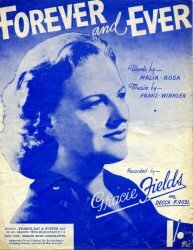 Arranged for Voice and Piano with Ukulele, Guitar and Piano Accordion Acc. 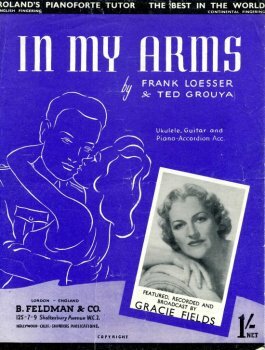 by Frank Loesser and Ted Grouya. 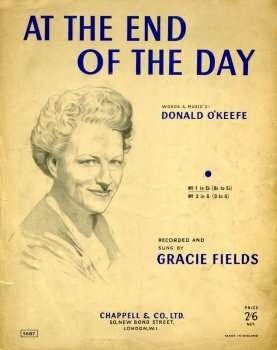 Featured, Recorded and Broadcast by Gracie Fields. 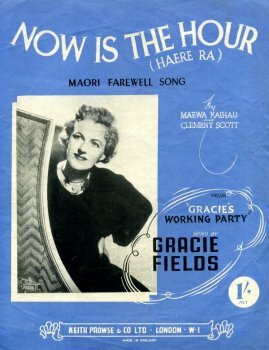 by Maewa Kaihau and Clement Scott. 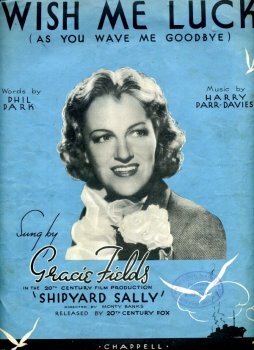 As sung by Gracie Fields in " Gracie's Working Party"
Also with 3 part harmony. 4 Pages including the front cover. Words and music by Harry Parr Davies. Words and music by Stephan Weiss. 4 Pages (2 pages of music) Includes front and back covers. Words by Phil Dark, music by Harry Par-Davies. 4 pages including front and back covers. You Can't Be True Dear. Words and music by Cliff Friend and Dave Franklin. Front and Back covers plus 2 pages of music. 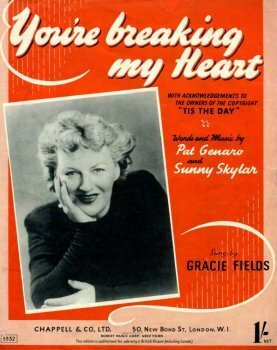 Words and music by Pat Genaro and Sunny Skylar. 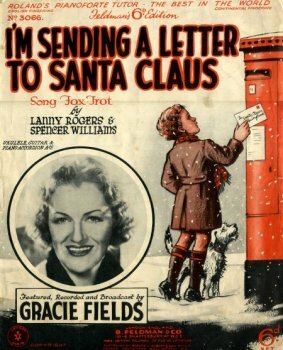 As sung by Gracie Fields.